Background: Controversy exists on whether laparoscopic paraesophageal hernia repair should be done with or without mesh. Arguments for use of mesh center on decreased incidence of recurrence. Arguments against the use of mesh center on increased incidence of severe long-term adverse events. We performed a decision analysis to address this issue. Methods: Decision analysis is an analytical technique to explicitly express and calculate all factors involved in a decision. 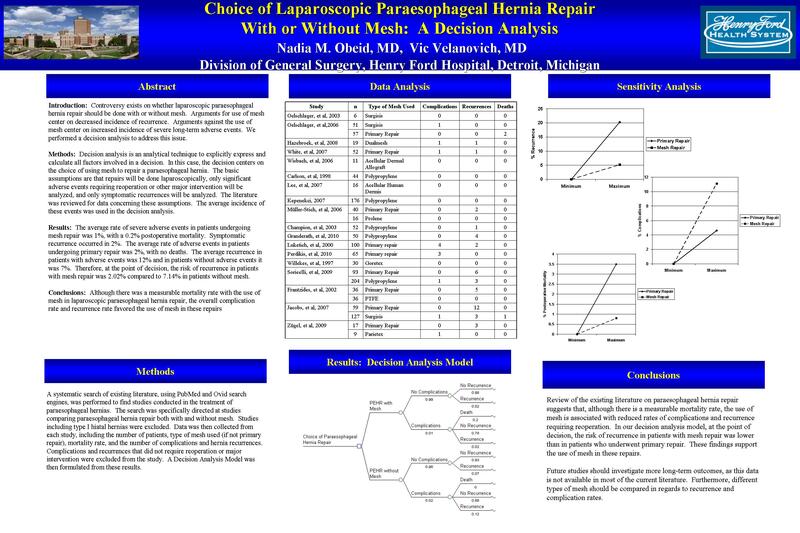 In this case, the decision centers on the choice of using mesh to repair a paraesophageal hernia. The basic assumptions are that repairs will be done laparoscopically, only significant adverse events requiring reoperation or other major intervention will be analyzed, and only symptomatic recurrences will be analyzed. The literature was reviewed for data concerning these assumptions. The average incidence of these events was used in the decision analysis. Results: The average rate of severe adverse events in patients undergoing mesh repair was 1%, with a 0.2% postoperative mortality. Symptomatic recurrence occurred in 2%. The average rate of adverse events in patients undergoing primary repair was 2%, with no deaths. The average recurrence in patients with adverse events was 12% and in patients without adverse events it was 7%. Therefore, at the point of decision, the risk of recurrence in patients with mesh repair was 2.02% compared to 7.14% in patients without mesh.